Activation of 5HT2A receptors is on the whole bad. The more receptors we have, the more likely they’ll activate, so it’s better to have fewer receptors. Activation of the 5-HT2A receptor is necessary for the effects of the “classic” psychedelics like LSD, psilocin (‘shrooms’) and mescaline (peyote), which act as full or partial activators at this receptor (Activators acting at 5-HT2A receptors located on the apical dendrites of pyramidal cells within regions of the prefrontal cortex are believed to mediate hallucinogenic activity) (R). 5HT2A receptors are commonly found in platelets, the heart, joints, immune cells (monocytes), the vagus nerve (R) and brain (hypothalamus, brain stem, prefrontal) (R). 5HT2A receptors decrease with age (R). This receptor exhibits a circadian rhythm (R). There are more serotonin receptors that are likewise interesting. 5HT2A receptor activation is one of the contributing factors to CFS. This receptor is important for people with the CIRS subgroup of CFS because this receptor increases TGF-beta (R). This receptor also decreases glutathione (R). When it comes to mold illness and CIRS, it’s interesting that some ergot alkaloids of fungi activate the 5-HT2A receptor (such as agroclavine, which is found in corn and Ergovaline (R)) (R). LSD is the most famous ergot-like compound that activates the 5HT2A receptor, and the symptoms produced by LSD are similar to some symptoms produced by mold toxicity, including an altered sense of time, visuals disturbances and anxiety. These ergot compounds that activate the 5HT2A receptor also restrict blood flow, which causes a variety of health problems because of low oxygen. Activation of this receptor causes anxiety, OCD, depression, fatigue, lower heart rate, lower blood pressure, insomnia and less deep sleep. 5HT2A receptor activation probably contributes to fatigue and depression after orgasming, and maybe POIS. These are a cluster of issues that are commonly experienced by people with chronic health issues and which can partially be explained by the 5HT2A receptor. Even more interesting, 5-HT2A has sialic acid in it, which is bound to by lectins. When I took sialic acid supplements, my reactions to lectins go down. It could be that one of the negative effects of lectins are by binding to sialic acid, which are found on 5HT2A receptors and lectins could activate these receptors or change them in some way. Therefore, I wouldn’t be surprised if this receptor was implicated in lectin sensitivity to a degree, given all of its associated symptoms. In addition, Inositol reduces 5HT2A receptor function (R), and it also seems to reduce lectin sensitivity and also OCD and anxiety related to lectin consumption (R). Now a lot of the differences between people not only have to do with the genes of the 5HT2A receptors (scroll on), but also inflammation. IL-1b increases the responsiveness of these receptors (at least in some cells) (R), which can exacerbate someone’s genetics. Last, we know stress is even more significant to people with chronic health issues. Stress can exacerbate health issues in part by 5HT2A receptor activation, which is the case in animals (R). Normally the 5HT2A receptor can shut down the amygdala, but stress prevents the calming of the amygdala (R). Cortisol can increase 5HT2A receptors in some animal models (R). Th 5HT2A receptor is a nice piece of information that is able to connect all of the symptoms of people with chronic or nagging health issues that aren’t taken seriously by the medical establishment. Now, even though 5HT2A receptors are important, it’s just one piece of the puzzle. Anxiety and neuroticism. In particular, it increases glutamate release and neuronal excitation (R). Increased TGF-beta (R) – this effect is reversed by NAC and lipoic acid (R). Reduced BDNF. When activated, these receptors decrease BDNF production (R). This is the mechanism by which psychological stress reduces BDNF (R). Increased arachidonic acid, which can be inflammatory (R). Suicide and depression. Suicidal and otherwise depressed patients have had more 5-HT2A receptors than normal patients (R). Blocking these receptors is a mechanism of anti-psychotics and can help depression (R). This receptor may to some extent account for the difference in outcome of antidepressant/SSRI treatment (minor alleles generally more likely to benefit) (R). 5HT2A receptors are in high concentration in the default mode network [DMN], which is overactive in depression (R). This brain network is implicated in self-related thinking and mind wandering. Chronic Fatigue Syndrome. One study has linked abnormal 5-HT2A polymorphisms which may enhance receptor activity with Chronic Fatigue Syndrome (R). It’s possible that by activating the 5HT2A receptors, fatigue occurs because orexin neurons are shut off. Antipsychotics that block 5HT2A receptors were found to activate orexin neurons (R). Insomnia and sleep problems (R). IBS. People with genes who produced more 5HT2A receptors were more likely to have IBS (T allele for rs6311) (R). When I took LSD (strong 5HT2A activator), it caused serious GI issues, which fits with this. Decreases Slow Wave Sleep (along with 5HT6….. 5-HT1A, 5-HT1B, and 5-HT7, MAOA and serotonin transporters have been implicated in the control of REM sleep) (R). OCD. Higher numbers of 5HT2A receptors in the caudate nuclei are associated with OCD (R). Blocking the 5-HT2 receptor has been shown to enhance therapeutic responses to SSRIs in patients with major depression and treatment-refractory obsessive–compulsive disorder (OCD) (R). Pain. These receptors are found in the spinal cord regions that control pain(R). Activation of 5-HT2A receptors potentiates pain produced by inflammatory mediators (R). Autism. These blockers may also be effective in ameliorating some symptoms associated with autism and other pervasive developmental disorders (R). Autistic people have more 5HT2A receptors (in platelets) (R). Tourette’s (R) and head twitch response (R). Increased prolactin, cortisol and renin (activation of the 5-HT2A in the hypothalamus) (R). Decreased blood flow to the heart (R), skin (R) and other places. 5HT2A causes your blood vessels to narrow (vasoconstriction of smooth muscle cells) (R). Decreased blood flow can contribute to people feeling colder. Increased platelet clumping (R), which can worsen blood flow and cause heart disease. Decreased sexual function (R). 5HT2A activation is part of the mechanism of SSRI-induced sexual dysfunction. 5HT2A/2C blockers helped people with SSRI-induced sexual dysfunction, in a small pilot trial (R). Maybe helps skin repair from the sun. Blocking 5HT2A helps skin repair from UVdamage (R). Lower heart rate and lower blood pressure (mediated by the vagus nerve) (R, R2). Reduce inflammatory effects in several tissues including the heart and gut (especially against TNF-induced inflammation). Enhance dopamine in the areas responsible for a higher level of thinking (PFC), which enhances memory and plays a role in attention and learning. Increase oxytocin and ACTH (activation of the 5-HT2A in the hypothalamus). The lower heart rate and blood pressure are produced via the inhibition of Rostral Ventrolateral Medulla (RVLM) in the brain stem, which controls the baroreflex (R). The baroreflex controls blood pressure and people with chronic fatigue often have low blood pressure. These effects could, in part, be mediated by the 5HT2A receptors. Other effects could be as a result of lower orexin activation, as orexin neurons from the hypothalamus stimulate the RVLM (R). The RVLM is the primary regulator of the fight or flight nervous system, sending excitatory signals to the sympathetic preganglionic neurons in the spinal cord, via reticulospinal tract (R). In animals, the 5-HT2A receptors increase body heat by causing vasoconstriction in skin (mediated by brainstem) (R). Animal studies suggest that activation of 5-HT1A, 5-HT2C, 5HT1B, 5HT1D, 5HT5, 5HT7 receptors may counteract the effects of activating 5-HT2A receptors (R). There are over 255 SNPs in this gene (R). But here are the main ones. SelfDecode has all these SNPs and many more. The “T” allele results in more receptors/increased gene expression and more active receptors (R,R2). TT is associated with depression, panic disorder, and a higher stress response. The T allele is associated with IBS (R) and CFS (R). The C allele is associated with an extraverted personality, rheumatoid Arthritis and novelty seeking. CC=3.6x increased risk of sexual dysfunction when taking SSRI Antidepressants (R). This SNP correlates perfectly with rs6313, as in the T allele here will result in the A allele by rs6313 (R). The A allele was associated with lower general health and social function scores (p=0.0032–0.034) (R). GG is more common in suicide attempters (R). The G allele has been associated with higher extraversion personality scores among borderline personality disorder patients and the presence of visual and auditory hallucinations in patients with late-onset Alzheimer’s Disease (R). In schizophrenia, GG tends to do worse on working memory tasks than do individuals with an A allele (R). This SNP correlates perfectly with rs6311, as in the A allele here will result in the T allele by rs6311 (R). ~7% of the alleles in the global population are “A“. So GG is the common version. The A allele had reduced ability to activate the receptor or cause downstream signals. This means it causes a blunted signal after activation (R). (Technical: reduced ability to activate phospholipases C and D, suggesting that signaling through both G(q) and G(13) pathways is hindered) (R). AG is associated with ADHD, better response to antidepressants, worse memory (R). AG was associated with better response to the SSRI paroxetine (Paxil) (R). GG had a better memory (R). Although common, GG or AG has higher rheumatoid arthritis risk (R). This SNP codes for GNB3, which in turn codes for a second messenger complex associated with 5HT2A receptor signaling (R). 47% of the alleles in a population are “T“. The T allele is thought to increase the second messenger signaling (R). T allele carriers are 2-3 fold more likely to be obese in Caucasian, Chinese, and African American populations (R). T carriers are clearly at higher risk for hypertension (R). TT women gain significantly more weight during pregnancy CT or CC women and had a significantly higher pre-pregnancy body mass index (R). TT respond to Viagra better. 91% of them have a “positive erectile response” upon taking Viagra, whereas only around 50% of CT and CC individuals respond equivalently to the drug (OR=10, p = 0.01) (R). TT patients receiving clozapine over a long term for the treatment of schizophrenia gain significantly more weight (16%) compared to patients carrying at least one C allele in a study of Chinese patients (R). T carriers taking triptans for the treatment of migraines or cluster headaches were ~3 fold more likely to respond positively compared with CC (OR 2.96, p=0.0074) in a study of ~200 Caucasian patients (R). CT genotypes are more prevalent in gastroesophageal reflux disease (GERD) patients relative to healthy controls (OR 1.43) (R). CC individuals do not lose weight under sibutramine (weight loss drug) therapy whereas CT and TT individuals do, based on a study of 131 obese Taiwanese patients (R). GG is the common genotype. AA=18% more likely to respond to antidepressant-citalopram, which decreases 5-HTR2A. (R). CC is the common genotype. The C allele is associated with higher physical fatigue, less vitality, and CFS (R). Although common, CC had significantly lower vitality than TT homozygotes (p=0.026) (R). Number of A alleles is associated with panic disorder (R). 5HT2A receptors are in high concentration in the default mode network [DMN], which is overactive in depression (R). This brain network is implicated in self-related thinking and mind wandering. Meditation leads to a reduced activity in the default mode network (R), which can help some of the negative effects of the 5HT2A receptors on depression. Inositol – reduces 5HT2A receptor function (R). Inositol and fluoxetine reduces 5HT2A receptor function at the receptor-G protein level (R). Chromium – decreases sensitivity of 5-HT2A receptors in humans are rats (which is indicated by chromium lowering the cortisol response to challenge with 5-HTP) (R). St John’s Wort. Some studies show St John’s Wort decreases 5HT2A receptors (R). However, other studies report a 50-percent increase in 5-HT2A receptors after six months of use (R). The negative effects of the 5HT2A receptors seem to work through activating GSK3 (R) and stimulating calcium release inside cells. Therefore, GSK3 inhibitors such as lithium might help. For the calcium release, magnesium may help. Other GSK-3 inhibitors include zinc, beryllium, mercury, and copper (R). 5-HT2A has sialic acid in it, which is bound to by lectins. I wouldn’t be very surprised if this receptor was implicated in lectin sensitivity to a degree, given all of its associated symptoms. Quetiapine – an antagonist of 5HT2A and to a lesser extent DRD2 (R). MDMA (R) -in recent MDMA users, post-synaptic 5-HT(2A) receptor densities were significantly lower in all cortical areas studied. LSD, chronically. Even though LSD activates 5HT2A receptors, chronic usage causes a decrease in the number of receptors, which may explain part of the longer term happiness effects (R). Microdosing LSD is something to think about. Lithium inhibits GSK3b (R), which can help fix this receptor, but it also decreases brain inositol (R). Estrogen increases 5HT2A receptors, while progesterone seems to counteract it (R). St John’s Wort increases the number of postsynaptic 5-HT2A receptors (R). LSD – agonist. Even though LSD activates 5HT2A receptors, chronic usage causes a decrease in the number of receptors, which may explain part of the longer term happiness effects (R). Microdosing LSD is something to think about. Agmatine supplements may activate the 5HT2A receptors (R). Found this after reading an interesting article looking for solutions to what I now define as drug induced psychosis through LSD in 2014. All of this stuff is very informative and interesting but I am looking to help my brain since this “difficult” trip years ago…have never been on any medications just taking different vitamins…this thread and article are all in relation to the difficult trip I experienced years ago. (Which, side note, I have tripped since then and had a couple of more difficult experiences where I️ experienced Catatonia once and then I always tripped again and had a beautiful eye opening experience that most of us have while tripping) just looking for more info on supplements for my brain. Thanks for all your input and this article. Any suggestions are welcomed and I’d be happy to in to more detail about any experience to figure out what supplements to begin. All I️ can say is that I’ve felt different since those difficult experiences. Thanks! Count on it, anything this site says will be completely wayward and fanatically counter-productive in one way or another, with a typical dark online poser’s air self-importance and devious destructiveness. I remember… You’re that a**hole site that comes across as little else than a site where nazi psychiatrists would be “Trump” and you would be Trumpsters, with about the same toxicity, creepy underhandedness and unhinged zeal. MDMA causes depression that takes months, sometimes years, to recover from. It wrings out the serotonin from your system like squeezing a wet sponge until it’s completely dry. I suspect that many of the chronic depression diagnosis today are the result of MDMA usage. I am 60 years old and have microdosed LSD most of my life. For some reason it does the opposite of what is outlined in this article. Cannabis and alcohol, however, cause a lot of problems for me and I avoid them. Dilution of blotter LSD can be done using 80% distilled water and 20% 100 proof vodka. It takes a couple days for the dispersion, shaking every 8 hours or so. Be sure to do the math to get the dosage correct. I couldn’t agree more. Quetiapine falls into this category, and it is VERY well known for causing/contributing to joint problems. What I don’t know yet is if this can be reversed by going off of it… it’s also incredibly difficult to get off of, which is yet another reason why it’s simply irresponsible to casually include it in a list of drugs that people might want to try. It is literally going to take me a year to get off it from a dose of 16 mg!!! Please do not promote the use of quetiapine. Drug companies are already doing a very efficient job of that. And it is simply not true to flatly state that it ‘decreases depression.” The antidepressant effect has never been shown to work for more than 25% of all subjects in studies and only for a limited amount of time. This is a drug with profound and negative side effects. it’s probably appropriate for people who have been diagnosed with schizophrenia, but it is also widely prescribed off label for insomnia, which is what happened to me. Weight gain, dissociation, INCREASED depression, INCREASED anxiety, lowered cognitive functioning, much lower creativity, lack of motivation, fuzzy and out of it feeling all morning long, etc etc etc… I do not like to see this drug casually recommended, and I have first hand experience with it. So please do not do it again. I’m sure that this blog provides a lot of valuable information for a lot of people, but it is just plain irresponsible to put quetiapine in a list of drugs that people should take without a lot of information on the horrible side effects. Psilocybin (mushrooms) has also been shown to reduce the 5HT2A receptors in the brain. SO, after all that’s said, which of these supplements does actually DOWNREGULATE 5ht2a, not only “disconnect it temporarily”? I guess there’s a lot, lot more to investigate in these areas, and it would be awesome to actually get the results that ones actually looking for bout this. I’m not sure about inositol, I felt some benefits and some disadvantages, but for sure, agmatine isn’t for people with some PSTD symptoms like me. I tried it once to try to lower my blood pressure and it was like a kick in my head, terrible anxiety more than ever and a profound sense of hopeless. So calcium supplements can be an issue ? You are right. These informations are completely wrong. 5H2A Receptors activation may cure several psychological issues. Terrific results have been showed on chronic ptsd patients, also, read this article : https://www.sciencedaily.com/releases/2017/09/170904093724.htm . Sure, it s about therapeutic setting, otherwise that window of super neuronal plasticity could backfire. Inositol seems to resensitize serotonin receptors across the brain- personally it felt as if it did the opposite of what I’m looking for when I tried using it. The studies on this one are all over the board and mostly confounded with precious illness and gender so it’s hard to say what’s what. On that note, Cyclobenzaprine (even in low doses) has been a godsend for sleep- it lowered my prolactin and manipulated some other things that all fall in line with quieting 5HT2A activity. Also, as a 5HT2A antagonist it downregulates the receptor as well and has shown some clinical promise in attenuating some symptoms of fibromyalgia. There is this interesting study that associates antagonistic cross-talk between the 5-HT1A and 5-HT2A receptors (studied in midbrain pyrimidal neurons – although likely localize in the same fashion elsewhere in body). *side note: mGluR II stimulation has a suppressive effect on HPA activity. Just look up eGlumegad. I would posit that loss of function variants in the 5-HT1A receptor would exacerbate gain of function variants in the 5-HT2A receptors. This relationship may explain the therapeutic benefit of mixed serotonin agonists like LSD (which is actually a slightly stronger as a 5-HT1A agonist – see wiki page). I would like to add more to be more thorough, but I can’t at the moment. The whole piece is really valuable and just wanted to put this in your court. considering agmatine’s effects on hippocampal bdnf, do you think that it causes down-regulation of the 5h2ta receptors? Feverfew is also 5-ht2a blocker/antagonist. Also, Feverfew slows Histamine release from mast cells. Can you please link me to the study that shows Inositol reduces 5HT2A receptor function??? I think the best 5ht2 antagonist is feverfew. Also ginkgo is an 5ht2 antagonist. Thanks..
Click on the reference “R”. Thanks! I added Ginkgo and Feverfew. Microdosing psychedelics cause nootropic effects by 5HT2a activation. Too much activation induced by larger doses of psychedelics causes hallucinations(it could be a good calm trip or a bad scary trip). Set and setting matters. Also, if you’re so worried about glutamate excitotoxicity, why not just take memantine? Also, an overactive amygdala often causes anxiety, fear, and terror and is especially seen in people with PTSD. Neurosurgical removal of the centers of one or both amygdalas helps. However, there’s a region of the brain that gives you a sense of personal space which is also located in the amygdala. Removing this part of the brain usually results in people not having any sense of personal space, so that it wouldn’t bother them to get super close to you or for you to be 3 inches from where they are standing. The key issue is how to remove most of primitive darwinian fear centers of the brain WITHOUT removing the area of the brain responsible for personal space. Most cases of near fear elimination, however, happened accidentally when they were trying to treat amygdala based epilepsy where medicine didn’t help. Arachnophobia was neurosurgically removed from a man’s brain(they wanted to treat his epilepsy). Interesting, do you have references? So you’re saying: LSD causes glutamate excitotoxicity in the long term and I should counteract that with memantine? Do SSRIs have the capacity to lower one’s intelligence in the long run? If yes, what countermeasures could be undertaken? Not sure if its exactly related to this (still waiting for my 23andme results) but taking NAC (1800mg/day) has dramatically improved my wellbeing – especially anxiety, mood and attention have improved a lot. By what mechanism does 5HT2A increase calcium release into cells? And what dosage would one take? Both lavender and phenibut are the only things I’ve found that help my fatigue drastically and both inhibit calcium channels. 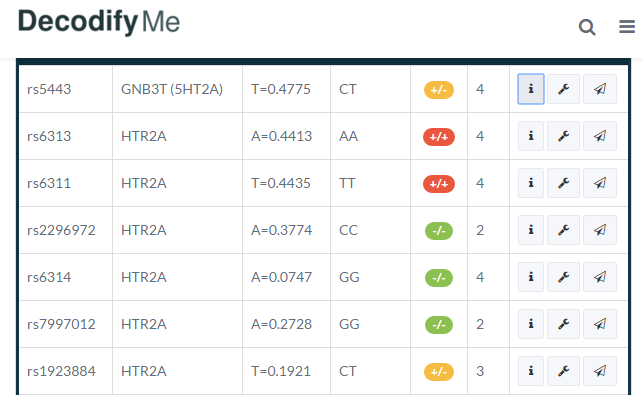 Also for your decofify.me website, may I suggest that the extra info page not block your genotype column (ie AA / TT etc). If you click on the “i” then your genotype gets blocked so I find I keep having to close the “i” page to recheck. Ideally the “i” page (the one under the actions column) would have your genotype listed at the top. Don’t look great, I agree. What do you think of the site? Lots of great changes are coming, so check back every month or so. If you are having calcium channel issues, consider a CA channel inhibitor (perscription) like Gabapentin or Lyrica. May do wonders. Also consider a low oxalate diet, or the Vitamin K protocol. If you respond to either, you may want to supplement your drinking water with Phosphorus. Low oxalate diet actually looks very interesting. I’ve been on high dose vitamin c, and also sometimes see white particles in urine. Seems like strong signs of high amounts of oxalates. The problem with MDMA though is the big risk. From what I have read the huge increase in cortisol can really throw the body off. I’d be curious to know what you think is going on in users that experience adverse reactions like long term anxiety/depression and ton of physical issues after MDMA even when rarely used . Many people think its a serotonin problem but from reading around it seems like it is more likely everything including the whole stress response HPA system? You say the 5-HT2A receptors would essentially be down regulated but in this scenario it seems like activation of 5-HT2A. I’m not recommending MDMA for this…I just happened to see a study regarding it. Tianeptine may be a good fit then? It has the opposite action to SSRIs and still paradoxically improves serotonin availability. Hmm, I forgot about that study. I changed my recommendations. any way around that? keep lithium dose low and increase inostiol? Lithium increases 5ht2a activation, worsens chronic fatigue, worsens ocd, worsens depression, worsens hallucinations, worsens suicidal ideation, etc., etc. Make lithium recommended for increasing 5ht2a activity. While inositol supposedly counteracts 5ht2a activation, it seems to do the opposite in higher dosages and feels exactly like taking tryptophan. Does it work against 5ht2a activation induced ocd? People claim so but I doubt it. People claim it lowers serotonin (the neurotransmitter in the blood) but I really seriously doubt it, I think it does the opposite. Did you ever microdose LSD? I remember you mentioning it at some point. I took 1p-lsd (100ug) and found my anxiety basically completely gone while it was still in my system. It was quite amazing and I wonder if a lower dose would be able to do that but without distorting my visuals. Btw, what would you suspend lsd in for a solution dropper? I heard vodka, but I’m wondering if you have any better ideas as vodka would still oxidize the LSD albeit at a slower rate. Same here. Effect lasted for about 1 week afterwards.